It's nearly three years since the author of Stone Butch Blues left the world, and Riki Wilchins is still grieving. 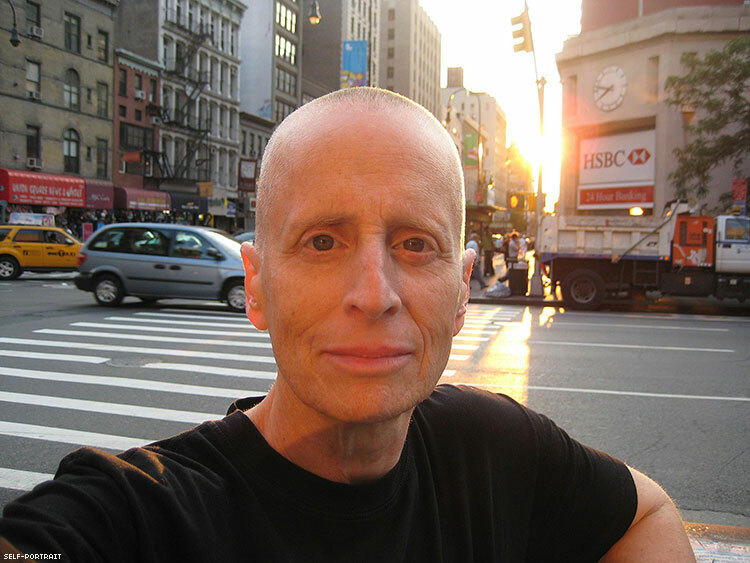 It was under a huge, wet blue tarp at Camp Trans outside the Michigan Womyn’s Music Festival that I first saw Leslie Feinberg hold an audience spellbound. That speech was to be our main presentation for the day, but all morning it had been raining intermittently, so we thought that would force us to cancel the event. But camp organizer Janice Walworth had thought ahead, unveiling an enormous blue plastic tarp and the poles with which to string it up. Even with the tent set up, many of us doubted that festival attendees would walk the now-muddy mile or so road out of MWMF in the rain to attend. But come they did, in twos and threes. Silently assembling under the tarp as the rain slowly cleared. By kickoff time, 200 women sat quietly on the ground, waiting for Leslie. She did not disappoint them. I saw Leslie do it again the night before the vigil outside the murder trial for Brandon Teena’s killers in Falls City, Neb. Forty of us had come, and trans activist Davina Gabrielle had organized a town hall speak-out in nearby Kansas City. Leslie held the entire room enthralled with an impassioned speech about violence against transgender people and about Brandon’s recent death. This was all very different from when I first moved to New York City. Then Leslie was mainly known for her reputed relationship with Amber Hollibaugh, who was already recognized as a brilliant theorist and a passionate activist. In this time before “transgender,” everyone seemed to be either male-to-female or female-to-male. Leslie was complex, in gender and in politics. No one could quite figure out what she was doing. To begin with, Leslie identified as female-bodied, butch, lesbian, and transgender. For pronouns, it was all about context: "she/her” in nontransgender settings but also "he/him" to honor Leslie’s gender expression in other situations. Plus the gender-neutral "ze/hir" were always welcome. Politically, Leslie described herself as "an antiracist, white, working-class, secular Jewish, transgender, lesbian, female, revolutionary communist.” This was a lot. Perhaps too much for any of us to digest in our binary male/female, transsexual-oriented frameworks. Whatever else, Leslie floated on the periphery just outside of everyone’s awareness, beyond our binary categories. In the end it was our categories that changed, not Leslie. Ironically, Leslie, who had little use for binary definitions personally, gave this butch/femme identity a power and presence and immediacy it had never enjoyed before. But even more, Leslie used butch/femme as a foundation to speak directly to the experience of tens of thousands of enraptured readers well beyond the subculture who also knew the pain, ridicule, rejection, and danger of being in some way genderqueer. The book and Leslie’s identity caught something in the zeitgeist. Leslie became not just an instant celebrity; Stone Butch Blues provided enormous visibility to the growing movement for transgender rights. It was about this time that my first book, Read My Lips, came out. It was a difficult, personal, angry, sometimes theoretical book, over which I had labored for years. And I could only watch Blues’ sales with envy, sometimes wishing I had written fiction instead, but wondering if I could ever be as good at it. Leslie brought to these public appearances an amazing personal presence. Part of this was a ruggedly handsome profile that was made to be struck on coin or cast in bronze. Then there was the distinct, raspy voice that always conveyed a passion for tough causes. And then this tremendous awareness of power and privilege, which was probably informed by her deep communist-socialist beliefs. I remember speaking in a college town once at a time when I was everyone’s second speaker of choice. The students would pick me up at whatever airport and proudly inform me, “We had Kate Bornstein last year” or “Leslie keynoted our last Pride Parade.” I knew this was offered to please me, though I gritted my teeth in an agreeable smile. I was often tired and worn out from the flight, and the cars sent to pick me up were always subcompacts with three or four students on the greeting committee crammed in along with my six-foot frame. I would always take the front passenger seat to have a little bit of leg room, being careful to avoid the inevitable hamburger wrappers, french fry containers, and crumpled term papers on the floor. Then someone happened to mention that Leslie, who had probably taken the same flights from New York and was no doubt just as tired, always insisted on sitting in the backseat, to honor the work of the local activists. I could only wince. I think that was one of the main reasons Leslie stopped talking to me. I was too bourgeois, in a word, and I knew it. I came from a privileged family, and I wasn't woke enough to be particularly uncomfortable with it. I’d even financed my trans activism through a cushy job on Wall Street, the center of the capitalist enterprise, its very embodiment and emblem. When I launched GenderPAC, I effectively joined the traditional D.C. beltway political establishment, which I suspect Leslie disdained (often with good cause) and which was, in any case, quite unrepresentative of the larger community. And then there were theoretical differences as well. I could not see any way to map transgender politics onto the economics of class struggle to which Leslie had devoted their life. While we fought for many of the same rights, we did it from very different directions. The last time I saw Leslie speak was to n congregation of people who had turned out for a Boston memorial vigil for Chanelle Pickett, organized by trans activist Nancy Nangeroni. In years of sad events for dead transgender people I have attended, almost all people of color, this was easily the saddest. Chanelle’s identical twin sister, Gabrielle, who was also trans, spoke in simple grief and dignity to the crowded church about her murdered twin. To this day, even with an identical twin as my wife, I simply cannot imagine. We could not know she herself would be killed in New York City under similar circumstances only a few years later. As I said, the saddest of many sad stories. I thought that was probably effective fundraising, but it seemed a bit dramatic, a bit of workin’ the crowd. I had no way of know that Leslie was already struggling with serious health complications, including those from Lyme disease. There are some people — Kate, of course, is another — without whom you cannot imagine the trans movement. They inhabit some unique space that was not there before, but which somehow you cannot imagine doing without, which has come to feel entirely necessary and totally irreplaceable. November will be the third anniversary of their passing. As passionate and outspoken as they were, I still cannot believe that they are gone. The last time I saw Leslie was at an underground gym in Chelsea on 18th Street and Sixth Avenue called Better Bodies. Leslie still looked healthy, strong, manly. We were both working out. I nodded. Leslie looked forward and continued on past the weight rack. RIKI WILCHINS is an author and advocate.